Mag Kirwan is a force of nature. She’s the woman behind Goatsbridge Trout Farm in Co Kilkenny, which produces the first class fresh, smoked and tinned trout – as well as the amazing trout caviar – that you’ll find in many restaurants and shops. She is an advocate for small producers and Kilkenny food. She’s the person that you’ll find dressed up in a trout outfit at festivals, selling her tasty products and urging people to #EatTrout. So, when you get a call from Mag on a Monday evening in May, you walk away from the washing up and you sit down to talk properly. Especially when you realise what she’s trying to do! After telling me on stage at the Cookbook Chronicles during the Ballymaloe Litfest that she was frustrated by not being able to find trout recipes in cookbooks, she had decided to put one together herself. Her plan: the book would be called Fishwives, the recipes would come from the fishwives of Ireland, it would be funded by Goatsbridge and sold to raise funds for Hospice Africa Uganda, after her sister, journalist Miriam Donoghue, worked there. And it was to be launched on Friday 28 October as part of Savour Kilkenny. She had five months to pull it all together. Five months to herd the cats recipes together. Five months to get everything photographed and laid out. Five months to get the books published. She – and her team – did it. Fishwives was launched, as planned, at Savour Kilkenny and now you can get your hands on it. Mag is selling it directly from her online shop, it costs €20 and €15 of that goes directly to Hospice Africa Uganda. Every copy pays for a week’s palliative care at the Hospice, ending pain and suffering and enabling people to die with dignity. There are a total of 78 recipes from a variety of food writers and fishwives, including Darina Allen, Sally McKenna, Georgina Campbell, Clodagh McKenna, Sofie Skehan, Bibi Baskin. I’m proud to be a contributor and even prouder of Mag for pulling the whole thing off. I know you’re thinking about Christmas presents at the moment. With Fishwives, you’re buying a cookbook that will make a real difference to people’s lives – plus you’re getting a brilliant selection of fish ideas to play with. For a taster, check out my recipe below and then order your own copies here. Living with a brewer has made me realise that there’s much more to barley than Irish stew. 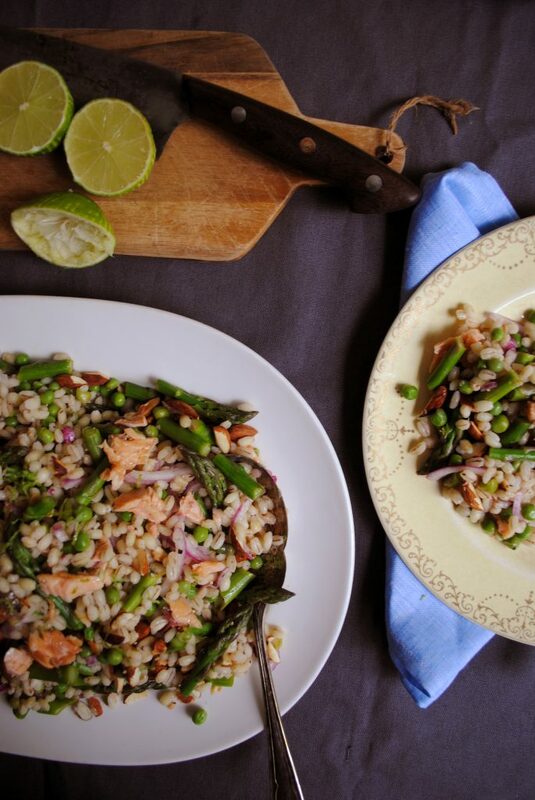 Wholesome, chewy and with a delicious nutty flavour, it makes a great base for salads, really letting the asparagus and smoked trout sing. Serves 4. Extra lime quarters, for serving. Place barley and 500ml water into a saucepan. Squeeze in the juice of half a lemon and add a good scattering of salt. Bring to the boil over a medium heat, cover and reduce heat to low. Simmer for 15-20 minutes, or until tender. When almost cooked, lay the peas and asparagus pieces on top of the barley and let cook for three minutes – you don’t want to cook these for long. Drain everything in a colander, rinse well with cold water, drain again and toss with a splash of olive oil. Meanwhile, toss the sliced red onion with the lime zest, juice and a pinch of salt in a large bowl and allow to pickle for at least five minutes. Toast the chopped almonds in a dry frying pan over a medium heat until golden; tip into a small bowl and allow to cool. Drain the oil from the trout – you can use this instead of olive oil in the dressing, if you wish – and flake into chunky pieces. Whisk the olive oil and white wine vinegar into the quick-pickled red onions and lime, then tip in the barley, peas, asparagus and almonds. Add plenty of black pepper, mix well and taste for seasoning. Lay on a serving plate and arrange the smoked trout on top. Serve with extra lime quarters, for squeezing over as you eat.